On August 25, 2017, DUC, in partnership with the Province of Prince Edward Island, the Government of Canada, and local conservation groups, celebrated important restoration work completed at Blanchards Pond—an irreplaceable natural asset in St. Felix, P.E.I. 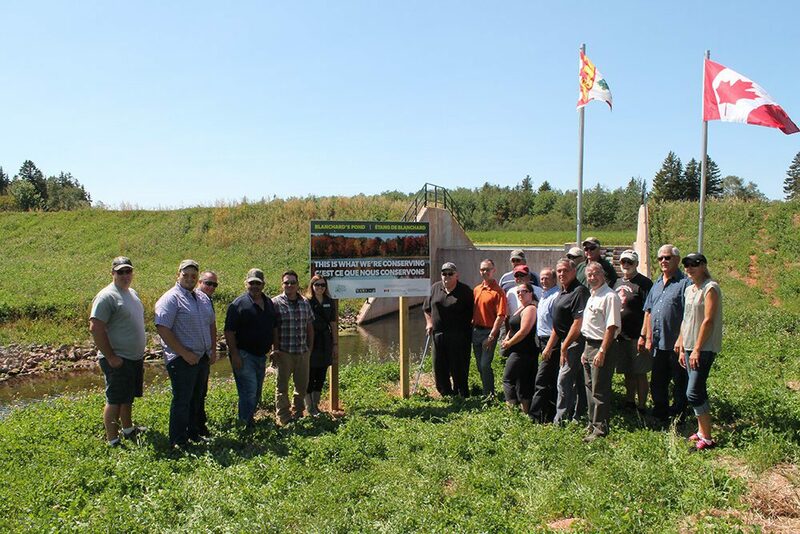 “The re-building of Blanchards Pond is a great example of what can be achieved when partners with similar interests work together,” says Tom Duffy, DUC manager of Atlantic operations. DUC first collaborated with the province to do restoration work at the marsh, located on provincially owned land, in 1971. The shared goal back then was simple: provide high-quality habitat for wildlife and recreational opportunities for local residents. But during a December storm in 2014, more than 150 millimetres of rain fell in western Prince County. The deluge caused a massive washout of the dam, draining much of the marsh. The following year, the Province and DUC agreed to repair the dam and rebuild a water control structure capable of handling heavier rainfalls, and one that would improve fish passage in and out of the marsh. This project wouldn’t have been possible without funding from the National Wetland Conservation Fund, administered by the Environment and Climate Change Canada, and the North American Wetland Conservation Act.